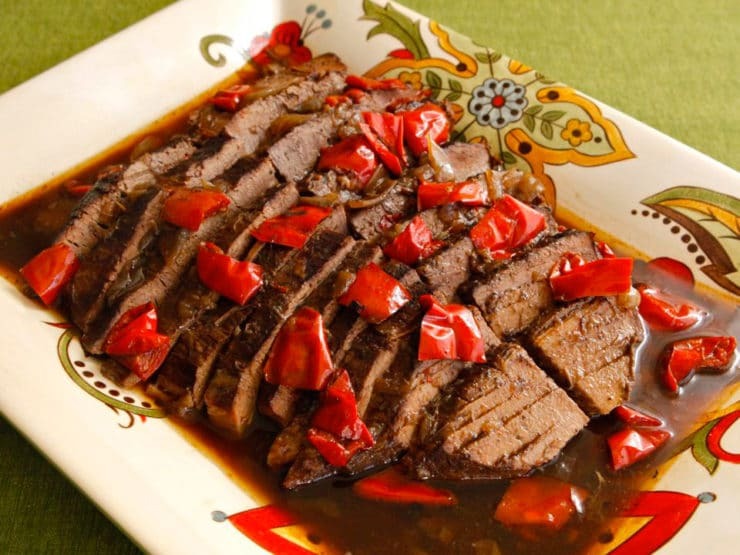 Rum and Coffee Brisket – Recipe for rum and coffee brisket cooked with onions, garlic and red bell peppers. Savory and perfect for the holidays. Kosher, Jewish. Rum… and coffee… brisket?? Sounds crazy, I know. And yet, you were curious enough to click through, which means you’ve got an open mind. Trust me, this is one cooking experiment you must try! I’ve been around the brisket block a time or two. I’ve done the traditional, the herb braised, the onion soup, the beer brisket. I’ve even dabbled in the exotic with Middle Eastern-inspired flavors, like pomegranate molasses brisket. Me and brisket are old friends. So this year, with the High Holidays approaching, I challenged myself to come up with something new and different. A few years ago, a friend mentioned to me that she uses coffee as part of the cooking liquid for her brisket. I loved that idea… something about the flavor of coffee and brisket seemed to just go together. I’d also seen a bourbon coffee brisket recipe in a cooking magazine a few years back (Bon Appetit, I think?) which sounded interesting. I don’t love bourbon, but when alcohol cooks down in a recipe like this it often tastes nothing like the original drink. I experimented with combining bourbon and coffee, then beer and coffee. I replaced regular coffee with a darker espresso blend, which gave the sauce a deeper flavor. Then my friend Gary, a chef, suggested rum. Bingo! The result was off-the-charts delicious. With onions, garlic, and red peppers added for a very subtle sweetness, this brisket turned out incredibly flavorful. It’s still that homey, comforting brisket we know and love… the tender, savory goodness you’ve come to expect at the holidays. And yet, there’s something different… something special. I had a few friends taste test it, and they couldn’t put their finger on what it was, but they all agreed it was amazing. When I told them it was rum and coffee, they were floored. Then they asked for seconds. Some of you might be put off by the idea of the rum, thinking the flavor will be too strong. Let me assure you that there is very little “rum” flavor to the brisket. When the alcohol of the rum cooks off, it leaves behind a trace of rum essence; it’s very subtle, the opposite of overpowering. What I taste here more is the coffee. 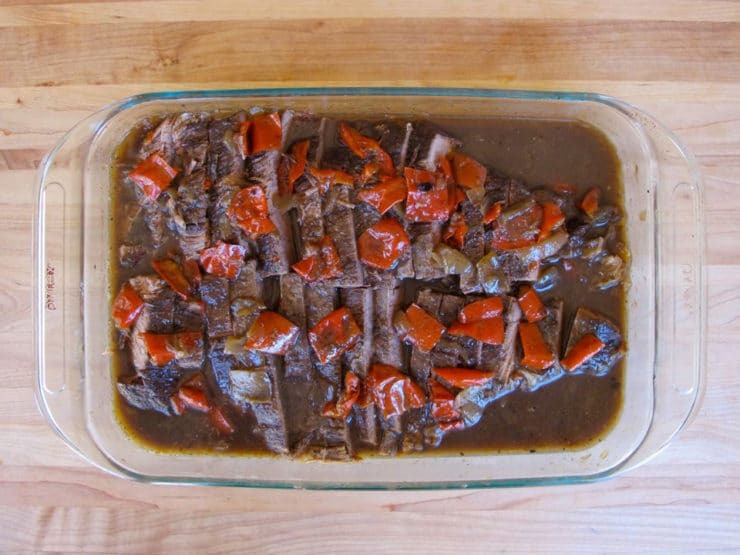 It makes a dark, rich, savory sauce that infuses the brisket with tons of flavor. Make it ahead if you can, and let the brisket marinate in the sauce overnight (or even two nights). Prepare to swoon. You’ll love it! What is your favorite way to make brisket? 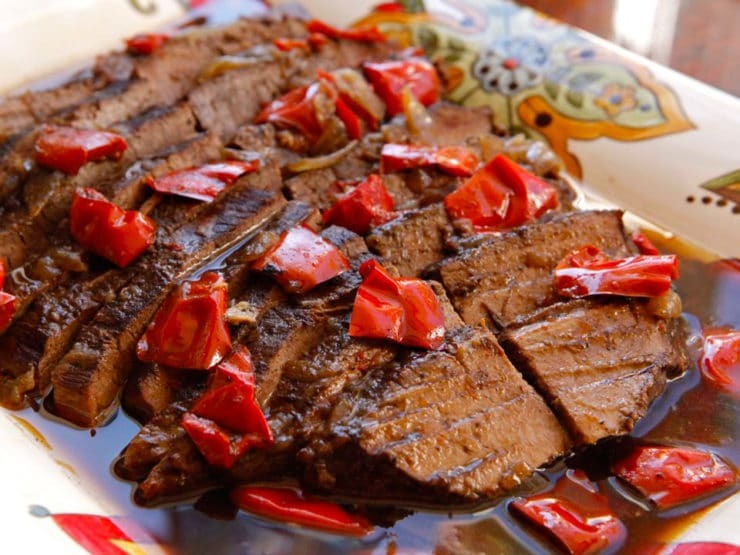 Recipe for rum and coffee brisket cooked with onions, garlic and red bell peppers. Savory and perfect for the holidays. Kosher, Jewish. You will also need: Large heavy roasting pan, foil, skillet (if needed), blender (optional). If making ahead, you will also need plastic wrap and a ceramic or glass roasting dish. Note: If gluten free, make sure all pre-packaged products including rum and beef broth are certified gluten free. If making for Passover, check to make sure your rum and all other pre-packaged products have a Passover kosher hechsher. Preheat your oven to 300 degrees F. Rinse the brisket and pat dry, rub with salt and pepper. Heat 2 tbsp of olive oil in a large roasting pan over medium high heat. Place the brisket into the pan. Brown the brisket on both sides (about 5 minutes per side). 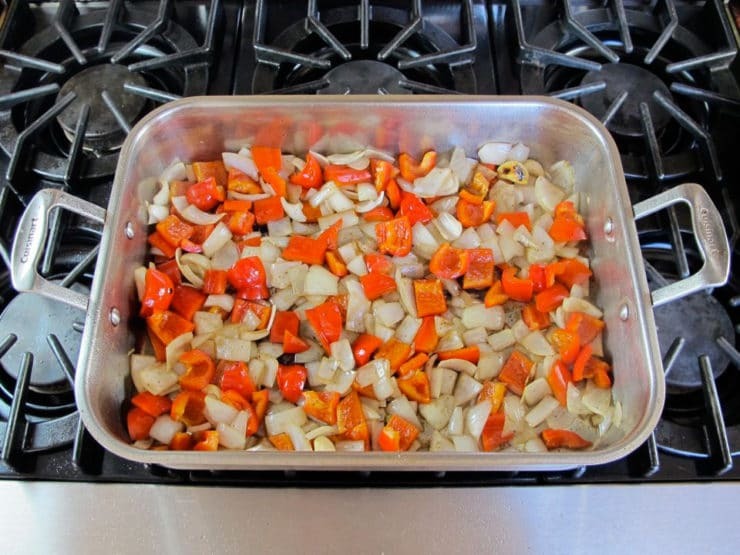 If you don't have a roasting pan that will heat up on your stovetop, you can do these initial browning and sautéing steps in a large skillet, then transfer everything over to a large roasting dish before putting in the oven. Remove brisket from the pan. Drizzle remaining 2 tbsp olive oil in the pan and add the diced onions, diced red peppers and garlic. Sauté the vegetables for a few minutes, scraping up the brown bits on the bottom of the pan with your spatula. When onion is translucent, add coffee and rum and bring to a simmer. Scrape up any remaining brown bits on the bottom of the pan as the liquid heats up. Place brisket back into the pan, cover with peppers, onions and liquid. Pour beef broth into the pan until it goes halfway up the sides of your brisket. 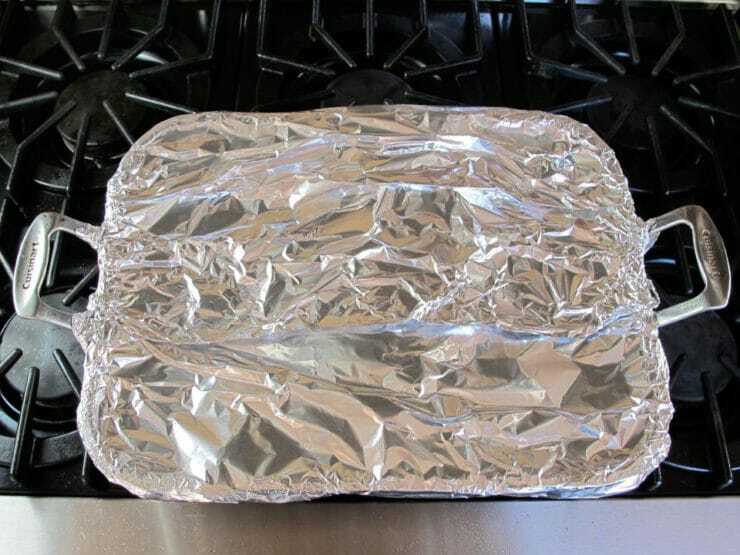 Cover roasting pan tightly with foil, tenting slightly so there is no contact between the foil and the ingredients inside, and place in the oven. Let the brisket roast undisturbed for 5 to 7 hours. It will take about 1 hour per pound of meat (leaner cuts of meat may take longer—test for doneness). Brisket is ready when it flakes and is fork tender. You can let it cook even longer for a soft, shredded texture if that’s what you prefer. When fully cooked, the brisket will have shrunk in size. 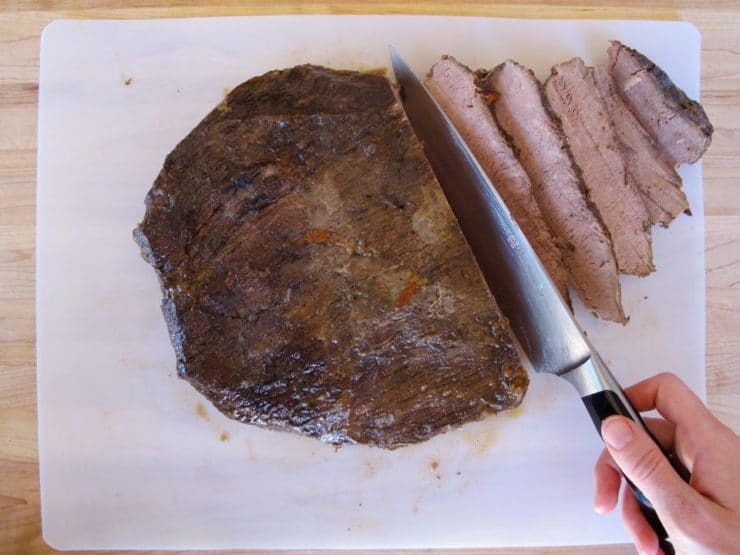 Remove brisket from the pan and let it rest on the cutting board fat-side up for 20-30 minutes. Meanwhile, pour the sauce and vegetables from the roasting pan into a smaller saucepan. Skim fat from the surface of the cooking sauce, then reheat the sauce until hot. 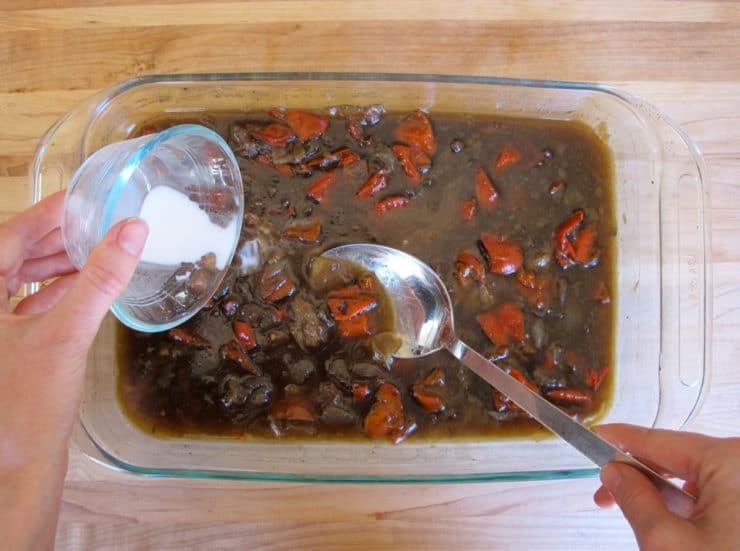 Mix together 4 tsp cornstarch and 2 tbsp cold water till smooth, then stir into the sauce. bring sauce to a boil till it thickens (add more cornstarch and water mixture to thicken further, if desired-- don't add cornstarch directly to the hot sauce without first mixing a little cold water in). Cut fat cap off the brisket, then cut the brisket in thin slices against the grain. 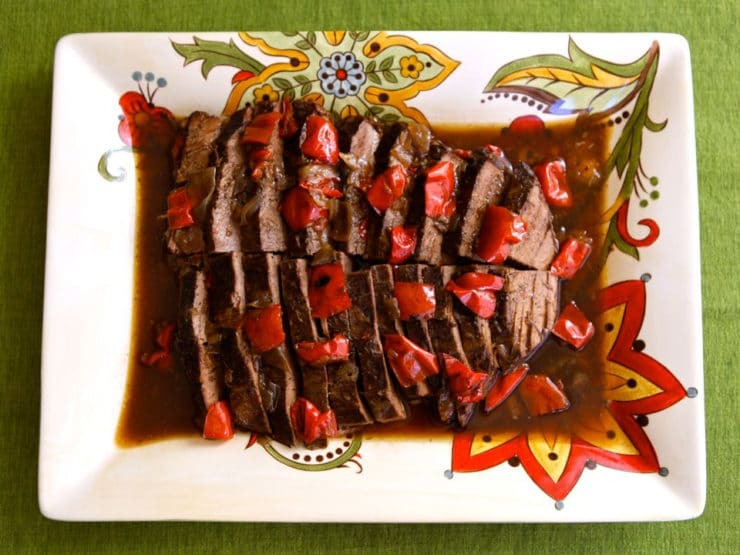 Serve brisket topped with warm sauce and softened veggies. Open the foil to vent and let the brisket slowly return to room temperature. Discard foil. 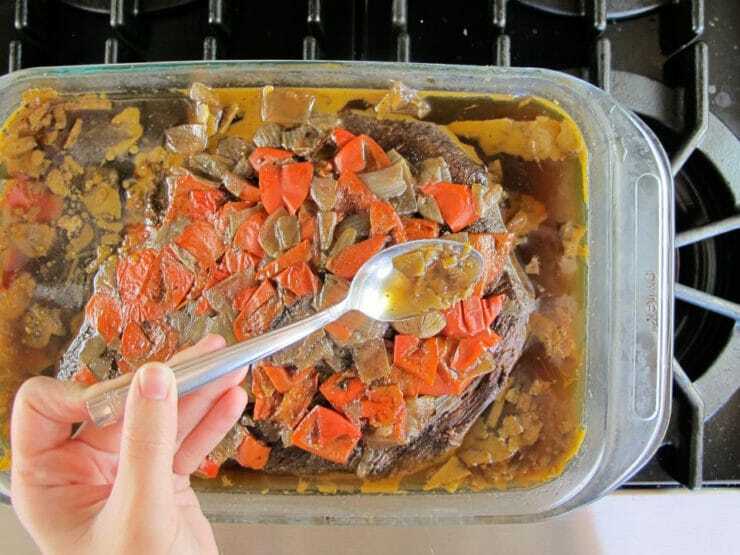 Transfer brisket, vegetables and cooking juices over to a glass or ceramic baking dish. Cover with plastic wrap and place in the refrigerator. Let the brisket chill overnight, or up to two days. You can also freeze the brisket up to a week ahead if you prefer. 1-2 hours before serving, remove the brisket from the refrigerator and preheat your oven to 350 degrees F. The fat in the sauce will have risen to the top and solidified. Use a spoon to scoop the fat bits out of the sauce and discard. 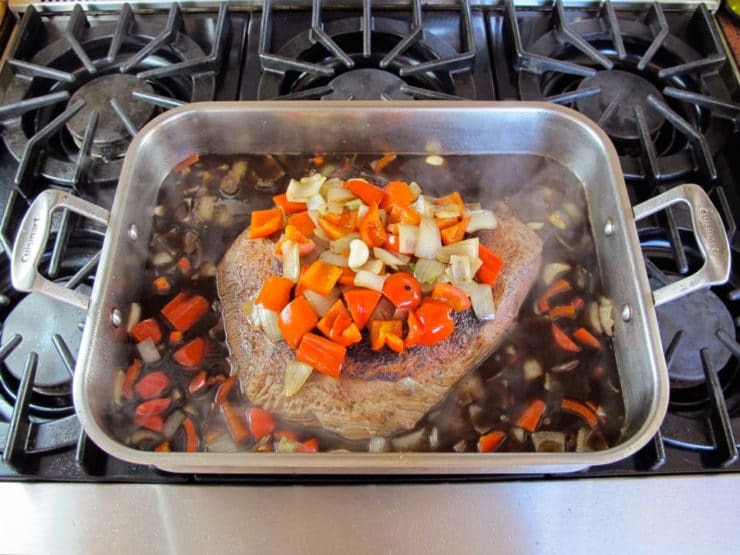 Take the brisket out of the dish and brush any excess sauce and vegetables back into the dish. Place brisket on a cutting board, fat-side up. 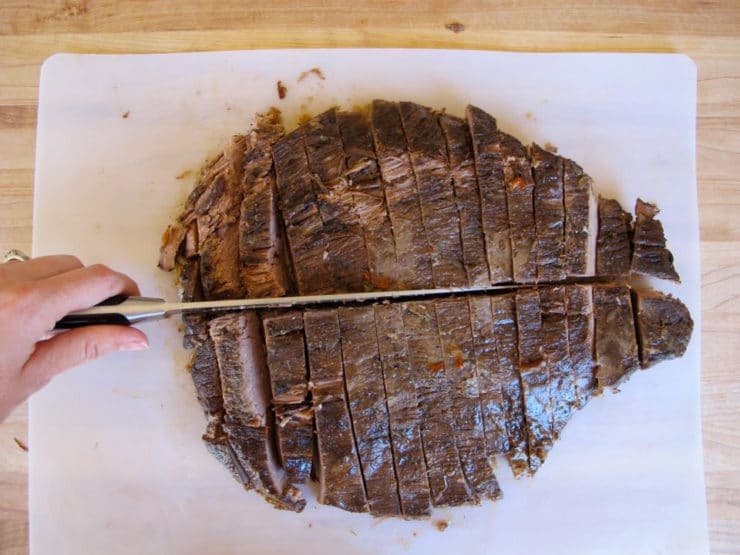 Slice the meat cold—first cut the fat cap off the brisket, then cut the brisket in thin slices against the grain. Take the brisket out of the dish and brush any excess sauce and vegetables back into the dish. Place brisket on a cutting board, fat-side up. Slice the meat cold—first cut the fatty flat cap off the brisket, then cut the brisket in thin slices against the grain. If my brisket is very large and wide, I often cut the slices in half lengthwise to make the size of the brisket pieces more manageable. Mix 4 tsp of cornstarch into 2 tbsp of cold water. Stir the mixture into your cooking liquid. Alternatively, rather than adding the cornstarch mixture, you can blend the sauce to make a gravy. Once you've skimmed the fat from the sauce, pour the chilled cooking liquid and vegetables into a blender and blend. This will make a thick and flavorful gravy, but you will lose the pretty pepper chunks. Either way works! Return the sliced brisket to the dish and spoon sauce and vegetables or blended gravy over it, making sure to spoon a little sauce between each slice. Cover the dish with foil and place it in the oven. Let the brisket roast for 45-60 minutes till heated through. You can cook it even longer to let it become more tender, if you wish. To thicken the sauce further, stir in more of the cornstarch/water mixture, a teaspoon at a time, into the hot sauce till it has thickened to your liking. Add salt and pepper to taste, if desired. Serve brisket with pan sauce and softened veggies. I’m planning to make this recipe but have an issue: beef broth. I don’t have time to make it myself and where I live it’s hard to find Kosher bones/etc to make the broth. So, I would have to buy the kosher type as I keep a Kosher kitchen. I’m not a fan of the boxed broths, is it ok to just use water or is the broth essential? I would even prefer to use veggie stock. Thanks! I wonder how the recipe could be tweaked for a pressure cooker? No adjustments to the liquid would have to be done (I assume) because you don’t lose any liquid in a pressure cooker like you do a crock pot. Hi Kelly, Tori’s assistant Ashley here. I’m sure there’s a way for this be made in a pressure cooker, however we haven’t tried it that way so I wouldn’t know what to recommend. Hi Evelyn! You can use the cook time and temp guidelines from the Savory Slow Cooker Brisket post for this recipe, but follow the sauce thickening method instructions in this post. I will try this after the Kzitzot. I understand the weirdness of coffee on a brisket. I was just as dubious with chicken, chocolate and tomatos, but it turned out a delicious dinner. Wonderful Tori, I was wondering how one could make this delectible mouth-watering treat in a crock pot? Gina, great question. I haven’t tried it but I think it would probably work, as long as you do the saute steps prior to putting the brisket into the crock pot. This was insanely good! My favorite brisket recipe for sure! Thanks So much for your wonderful blog, dedication, and of course recipes. I have made this recipe quite often – use different cuts of meat as well and each cut is so tasty. I prefer to use the veggies to thicken the sauce – boil a potato and mash that into the gravy. Barbara, have you used this recipe for an inside round roast? And if so did you change anything? Or have any recommendations in that regard? Why did my brisket taste bitter? I followed the recipe exactly. Colly, while I’ve never had a problem with overwhelming bitterness in this recipe, all meat dishes that are made with coffee will have a slight bitterness to them— it is actually considered a desirable trait in that it adds depth to the sauce. If, however, the sauce is too bitter for your liking you can add some brown sugar to the sauce (to taste), it should help to counteract the bitter flavor. I have this brisket in my oven right now but am wondering why you recommend moving it out of the roasting pan to refrigerate it when making ahead. 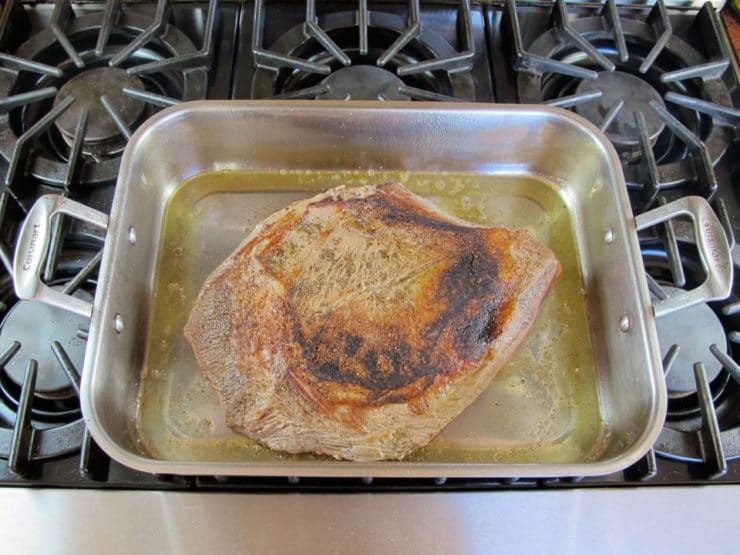 Hi Leah, metal roasting pans can react with acidic substances when sitting for an extended period of time, which can adversely affect the flavor of the brisket. Best to transfer it to a glass or ceramic dish before refrigerating. It came out great. My 10 years old granddaughter keeps asking me to make it again and again. Thank you for a great recipe. Btw, someone higher up on the comments list asked how brisket is called in Israel. It’s SHPONDRE. Strange name, I know. Glad you liked it Carmela! So many recipes, so little time….they all sound great, I mix tomato sauce, brown sugar, lemon juice, whole cranberry,place brisket over cut veggies, onions, carrots, celery, pour sauce over meat.cover tightley with foil, bake 3-4 hr. 350* until tender, remove meat ,add potatoes coook @ 1hr. enjoy…tastes better the next day. In the oven! can’t wait for it to come out. The Rum taste in the sauce is very strong in the beginning, and I hope it dissipates when done. right now it is not very pleasant. It will definitely cook off Carmela, just a hint should remain after the long slow cooking process. Enjoy! I made this for Rosh Hashana. It was awesome. Thanks for the recipe!! How much beef broth do you use I the recipe, please? 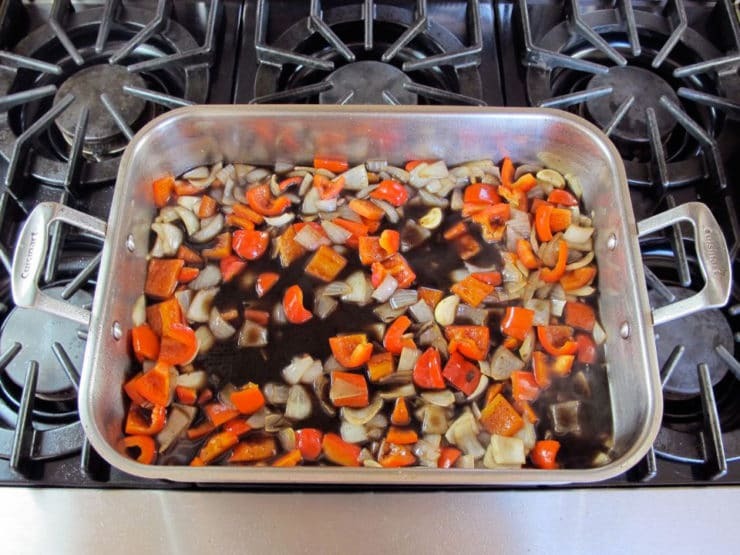 It depends on the size of your roasting pan or dish, which is why you don’t see an exact amount listed. You pour in the broth till it reaches about halfway up the side of your brisket, as in the picture. I read what you said about the sauce, so this afternoon i mixed extra beef broth into the liqued , then corn starch mixture. I put about 6-7 pieces of brisket in small wax-paper lined aluminum pans, covered with the sauce until almost the tippy top and froze. i did 3 pans of this – one im not freezing im going to serve for the pre-yom kippur meal. the meat was soooo tender it literally fell apart when i tried to cut it. YUM never thought id be caught snacking on brisket pieces but lol – why not right? you’re the best i am so excited to serve the roast. i also tried your shwarma recipe its heaven! Fabulous Mattie! G’mar chatima tova! hi hun, can I cook the roast, then slice it, separate into small dishes with your ‘make in advance’ sauce, and freeze? or will it come out weird? i saved up for a roast this sukkot, but i want to stretch over the whole yom tov. its cooking right now in the oven the whole house smells soooooo good. Good question Mattie… I’m not sure if there would be enough liquid for individual serving dishes. You can certainly slice the brisket and freeze it in sauce, then reheat, but I’m not sure about the individual portions. It also tends to reheat better with several slices together in the sauce, there is less chance of it drying out. It might be worth a shot though, if you put 5-6 slices in each dish. Just make sure that there is plenty of sauce on the meat as it reheats (about halfway up the briske)t, and cover with foil as you reheat.